Look at the following. This bogus ad or whatever you call it has been making its way around Facebook and I assume elsewhere on social media. It makes me wonder if the people behind such junk are intentionally trying to mislead people or are simply ignorant. Either way it certainly is not helpful and likely harmful. Many seniors believe this stuff and cowardly politicians never seek to explain the facts; the truth. The real shame is that with minimal effort the facts are readily available to anyone. It’s not a matter of opinion or politics, but facts and figures and the law. 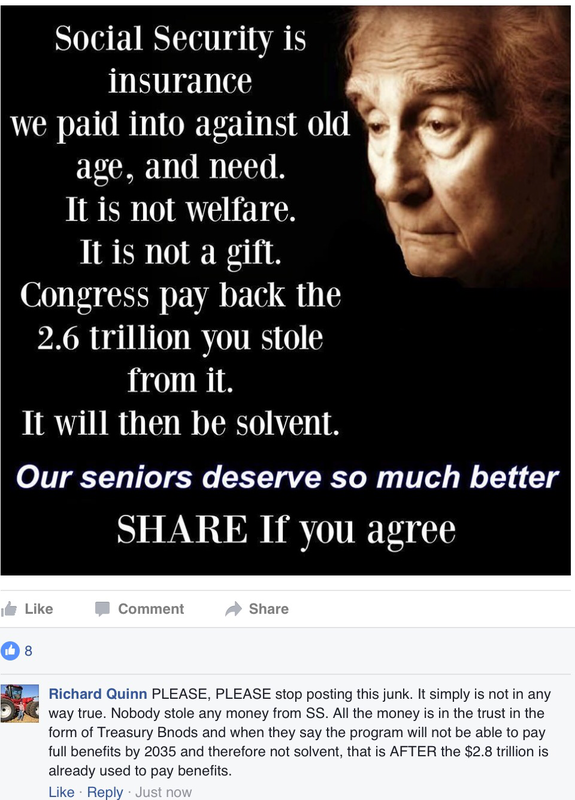 NOBODY STOLE THE SOCIAL SECURITY FUNDS. The trust holds $2.8 trillion in special US Treasury Bonds that pay the trust about $98 billion a year in interest which is now used to pay benefits. By 2035 or so all those bonds will be redeemed (the federal government will have to transfer the cash to the trust) so full benefits can be paid. Thereafter, about 75-76% of earned benefits can be paid from incoming payroll and other taxes… and the trust reserve will be depleted. This administration and Congress have ignored the issues faced by Social Security. Eight years wasted making fixing the problem that much more difficult and painful. Should government tell you how much insurance you need and what it should cover?